Ascend Math delivers an automatically assigned individual study plan for every student. Each prescriptive study plan reaches below grade level to provide a unique study path through skill gaps at each level. Find out why Ascend Math is different for teachers and students. 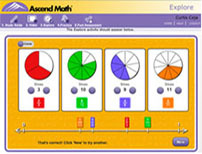 30 of your students can use Ascend Math free for 30 days. Hear how teachers are successfully using Ascend Math in their classrooms. Hear how Ascend Math motivates students and increases their confidence. Examine Ascend Math’s award-winning content in examples from 8 different levels.